Tonight The Walking Dead was back with it’s third exciting season and the show didn’t disappoint. With the birth of Lori’s baby just around the corner, the group had to find a new safe place to live and prison turned out to be their next home. There is rumor that Carl is going to be getting himself a girlfriend and from the looks that he and Beth were giving each other in tonight’s episode, it appears that he is going after an older woman, Beth. Not everything that happens in the comic book happens on the show, so don’t expect Rick to lose his hand anytime soon. 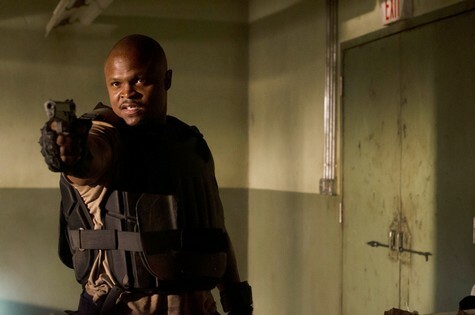 Did you see the season premiere for season 3 of The Walking Dead? We did and we recapped it here for you! On next week’s episode Rick is determined to keep the prison because they spilled blood to get it, is it Hershel’s? One thing is for sure, this season there are going to be some major characters dying and I hear it could be Lori or Glen. In the preview for next week, we see a grave with a cross on it and I doubt the group would do that for any of the walkers! seen doing in season three. Lori looks like she is about to pop, the way she was holding on to her belly I thought the baby was going to fall out. One episode is going to be devoted to Lori having the baby, hopefully they get it over with soon because she looks a little ridiculous holding on to her belly all the time. Will the baby be born a walker, if it is, maybe it will just attack her from the inside! Carl is going to become a killing machine, we got a little taste of it in the first episode of season three but he is really going to be at the fore front of a lot of the slaughter this season since he has essentially grown up as a child soldier. Daryl comes face to face with the other humans the group noticed when Rick was busy playing doctor and they are not a friendly bunch. How did you enjoy the first episode of the third season? Who do you think the grave belongs to? The sneak peek suggests it is Hershel because the group can’t stop the bleeding from the bottom part of his leg that Rick amputated. One thing is for sure, this season certainly gives a whole new meaning to being in prison! The Walking Dead Season 3, Episode 2 “Sick” airs on AMC, October 21st, 2012. Check out the preview video of episode 2 and let us know in the comments below what you think!